My first restaurant meal of 2012 was with R. as we celebrated our sixth dating anniversary. Six years!! In past years we have alternated between fancy, elegant restaurants like Braddock's American Brasserie and Mrs. K's Tollhouse in the DC area, and more low-key eateries like Mamma Lucia in DC. This year, we decided to go relatively casual: Dasonii Korean Bistro. I have been meaning to try this place for almost a year, and I was so glad we finally made it out there! Unlike my first Korean food experience in Pittsburgh at Golden Pig, which is a tiny, cozy hole in the wall out in what feels like the boonies, Dasonii is located inside a strip mall in the bustling Robinson area which a spacious dining room. With the dominance of American chain restaurants in the neighborhood, Dasonii provides a nice bit of variety in the dining scene. We found the fish (called "odeng") to be most intriguing. Unfortunately, the photo doesn't provide a good view of it, but it's basically small strips of pollock mixed with onions. The consistency of the fish is not what you would expect, however, as they were more like a fish cake. We requested a second helping of these. 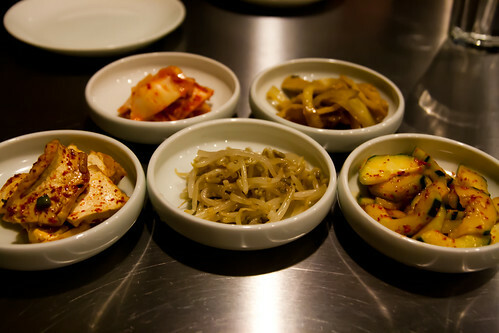 As for our entrees, R. ordered the Dolsot Bibimbap, a variation of the classic Korean dish. The difference between the Dolsot Bibimbap and the regular Bibimbap is that the Dolsot Bibimbap is served in a hot stone pot that makes the bottom of the rice crispy. R. said he didn't think the rice was very crispy, but I'm not sure that he had reached the bottom of the bowl when he made that comment. 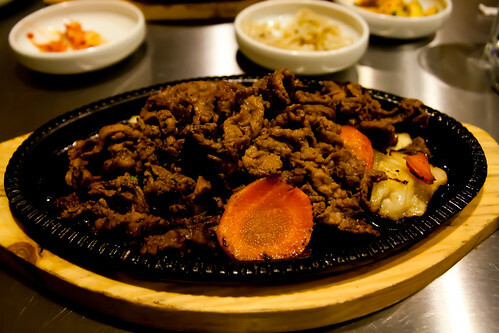 The Dolsot Bibimbap also comes with a choice of beef, vegetable, or seafood - an assortment of squid, clams, shrimp, and mackerel - which R. chose. 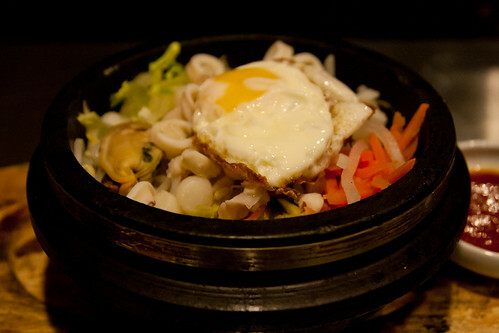 The bibimbap is topped with an egg and served with a spicy sauce. I had a bit of the Dolsot Bibimbap and thought it was pretty good, though not as good as the Bulgogi I got, which consists of thin sliced boneless rib eye marinated in a sweet and salty mix. Dasonii did a really great job with this! It was a delicious meal and we were both very satisfied. We ended up taking half of the food home as the portions were quite sizable. In sum, I liked Dasonii quite a bit, and am glad to have another Korean joint to add to my growing list of good Pittsburgh restaurants.